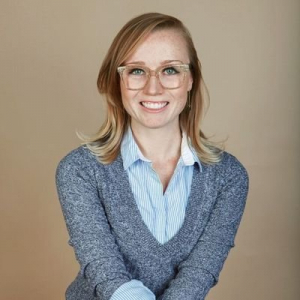 Former musical theatre actress and Hackbright Academy graduate, Chloe Condon is now a Developer Evangelist at Sentry. Perhaps the only engineer you’ll meet who has been in “Hairspray,” “Xanadu,” and “Jerry Springer: the Opera” – she is passionate about bringing people with non-traditional backgrounds into the world of tech. If you’re trying to place her face, yes – she’s the young woman giving the awkward thumbs up in the “What It’s Like to be a Woman at a Tech Conference” article (which she also wrote). In February of 2018 she was named one of the “200+ Thought Leaders in Crypto and Blockchain” and still knows absolutely nothing about Crypto and Blockchain. Seriously – not a thing. She considers it her greatest accomplishment. 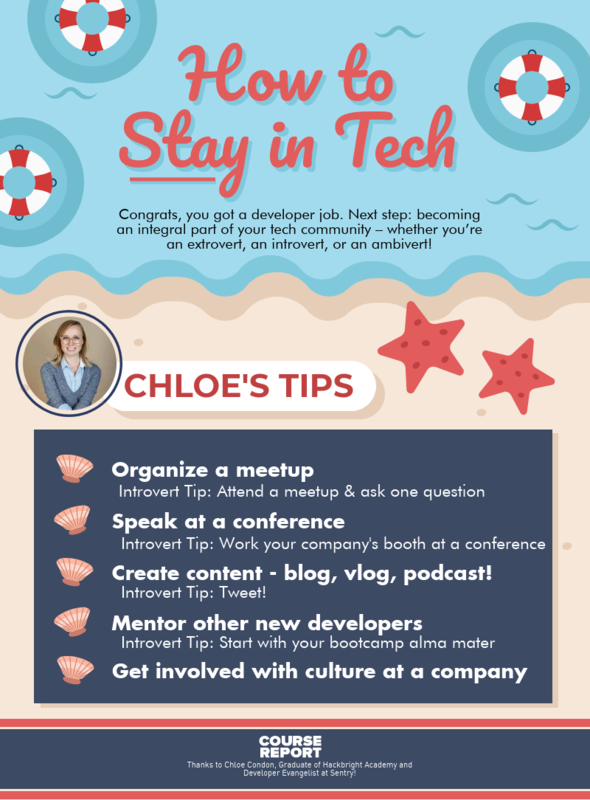 Recently, Chloe sat down with our partners at Course Report to share her insights and tips for getting, and staying, involved in the tech community. Coding bootcamps like Hackbright Academy help women break into the tech industry quickly, but we can’t ignore that women leave the tech industry 45% higher rate than men. In order to stay in tech, women need to feel involved in the community – and I’ve learned a few lessons over the last 2 years post-bootcamp. You don’t have to be an extrovert to be an integral part of your tech community; below are tips for extroverts, introverts, and ambiverts to flourish in tech. Being social and active in the developer community is something I love to do, but it can be exhausting. My role as a Developer Evangelist at Sentry is very unique; while a lot of my job involves relationship building with the developer community, creating content, and general thought leadership, I also love to be heads-down in code with nobody to distract me. The beauty of organizing a meetup is that it can be as elaborate or low-key as you want it to be. For example, my SF Tech Lady Picnic meetup is probably the most minimal-commitment event organizing I’ve ever done: wait for it to be over 70 degrees in SF, set a date/location/time, and show up. Literally, that’s it. Getting together and chatting with women in a park on our lunch break in warm weather is probably one of my favorite women in tech social events – there’s no exhausting conference before/after, no need to feel “on” and network, and you meet some really fantastic people. Not ready to start your own meetup? Many meetup organizers would love a helping hand! For an example, I organize Sentry Scouts (we even have a commercial)! Remember, I get paid to organize this one – I don’t recommend planning such an elaborate event on your own. Reach out to your local stressed-out meetup organizer (cough cough – if you’re in the Bay Area, do feel free to reach out to me in a Twitter DM) to see if they’d like any assistance with meetup logistics! Ok, full disclosure: I’ve been “performing” on stage for 20+ years. I also have been auditioning for 20+ years – having a degree in theatre gives me some unique advantages in the tech industry. I totally understand that the concept of public speaking and getting rejected may not be everyone’s cup of tea. But… I love it! And I would highly encourage you to submit to Call For Papers (CFPs) and try your hand at conferencing. 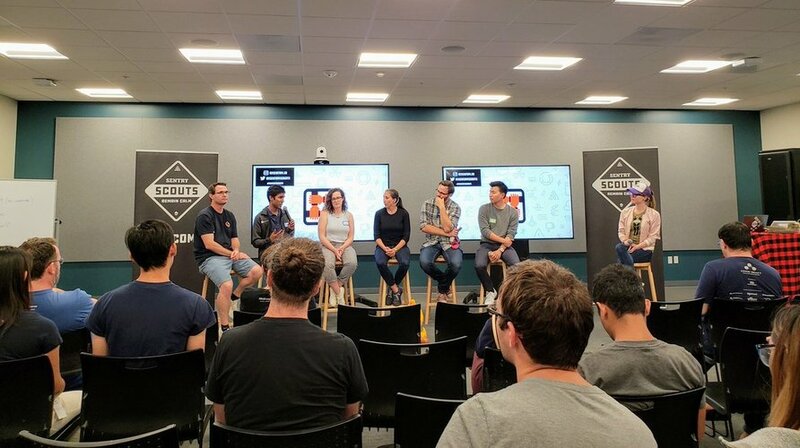 In my opinion, one of the best ways to get involved in the community (and especially create more visibility and awareness of women in tech) is to speak publicly about it. If you’re working on something cool/interesting, solved a difficult problem, or think there’s something you can teach the community about – submit a CFP. If you don’t book your first conference, keep trying. Have a mentor/co-worker/friend review your submission. Our VP of Engineering at Sentry, Ben Vinegar wrote this great post about getting a talk accepted at Fluent that you can use as a guide for other conferences. Conferences not your jam? Want to build up some public speaking experience first? Speaking at your bootcamp alma mater is a great way to test out the waters! Trust me: your bootcamp would love to have you give a guest-alumni/ae-talk. How do I know this? I give them all the time at Hackbright Academy and bootcamps I didn’t even attend! Creating content is a great way to stay involved in your community – no matter the medium! Showing people creating and working on things with technology that don’t look like the typical Patagonia-wearing white guy who went to Stanford is a big step in changing the ratio! Look, even I back out of attending meetups last minute. Commiting to a social event after a long day of work can require a lot of mental energy when all you want to do is be home on the couch with a cup of tea. But true fact: every meetup I’ve forced myself to go to, I end up being extremely grateful I attended it. I either learn a new skill, meet a new person to add to my network, or even get some cool swag! And there’s no requirement to mingle: you can totally lurk by the cheese platter and avoid eye contact (which I have 100% done). Bonus challenge: ask a question during the Q&A portion of the event! Doesn’t require a full conversation, and it’s done in a flash. If you enjoy conferences, but public speaking isn’t your jam – try working at your company’s booth! It’s likely that your company is sponsoring a conference or two this year, and they love having people with technical chops to help staff it and answer technical questions. Some of my favorite events have involved assisting the next generation of female engineers at high school hackathons, or learning-to-code events involving JewelBots and other forms of feminine technology to inspire young women to code. Warning: Assisting with one of these events will leave you feeling very inspired and full of hope. Having a voice in your company’s culture meetings is a fantastic way to impact the internal culture, hiring process, and much much more. Oh, what? Your company doesn’t have culture meetings? Suggest it to your HR team! By no means do you need to organize/run it, but making sure that all voices are heard within your company is a great way to create change. I get it – Twitter is not for everyone, but it’s a great way to keep up to date on what’s going on in the tech community. Find some awesome people to follow (@ladyleet’s fempire list is the perfect starting point), and get involved in the conversation. Tweeting is a low-commitment way to get your voice heard. If you have the time and bandwidth, mentoring at a bootcamp allows you to not only give back to the community, but also to see how far you’ve come since your time as a student. If your bootcamp doesn’t provide a mentorship program, reach out to Hackbright Academy or Turing School. Trust me: students breaking into the tech industry can value from your advice and experience, regardless of how long you’ve been working in the field. I hope that regardless of your introvert/extrovert tendencies, you find the best way to comfortably contribute to the community that suits your needs. Not all of us need to organize a meetup, speak on a podcast, keynote at a conference, and write. The first step in helping change the ratio of women in tech is to create more awareness – even “showing up” helps you become less of a number/statistic and more of a community member. Welcome to the Fempire – we’re so excited you’re here!